We are enthusiasts through and through - with plenty of experience to assist you with your historic car plans. This car has been 57 years in our family with just two owners from new. How can we assist you? 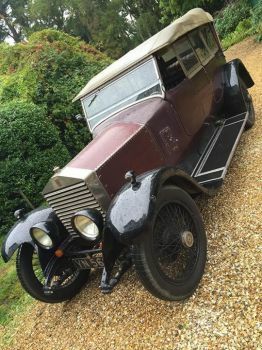 1926 Rolls-Royce 20hp HJ Mulliner tourer, with correct wheels and tyres, original paint, & has never been totally rebuilt. Our car returned yesterday from 700 miles in the week in France. This special car was bought from the original Harley St surgeon owner in 1958 for £550. Specified for camping, the front seat folds flat into a bed, and was used for camping at Chateau Impney hillclimb last month after the Ball - probably for the first time since the late 1920s / 1930s...An absolute delight.